Modern, adaptable and beautifully accomplished, the DS Prime is a true mirror of contemporary woman's best traits. Bright of temperament and spirit, the watch is an enticing composition that unites brushed and polished surfaces, clean geometric contrasts and subtle variations in textures. Its silver dial, adorned with three glistening diamonds at 12 o'clock, is at once sporty and lightly luxurious—the ideal complement to any style of dress. 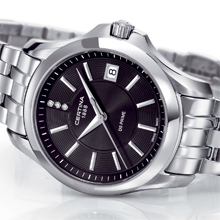 CERTINA's new DS Prime makes a beautiful bridge between the worlds of active sport and charming elegance. Its delicate 32mm stainless steel case is a gorgeous combination of surface finishes, with main areas of brushed 316L steel adding contrast to a polished bezel set alight with 12 Top Wesselton diamonds. In standard issue, its black nickelled hands and long indices mark time clearly but without excess, against a silver dial face accented by a broad strip of snailed circles cut by a date window at 3 o'clock, and a beautifully feminine mother-of-pearl central area. A handsome trio of diamonds stands at 12 o'clock, and a sloping rim neatly displays minutes around the dial. 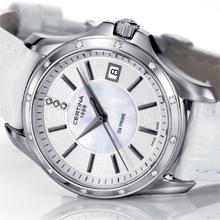 The watch is secured by a white leather strap with a butterfly clasp. For ladies with a very active lifestyle, the DS Prime is equipped with a sapphire crystal with anti-reflection coating as well as full DS Concept features, a reminder of which is shown by the letters "DS" on the tip of its protected crown. It is therefore water-resistant up to a pressure of 10 bar (100 m). The gorgeous DS Prime also exists in an all-steel version, with a black dial, steel hands and a five-row polished stainless-steel bracelet with a twin push-button butterfly clasp. In any version or configuration, however, the DS Prime is an impressive example of top CERTINA quality/price ratio, and is sure to be a reliable and worthy ally in your daily life, or chic evening outings. Polished bezel with 12 diamonds, Top Wesselton 32/24 VS-SI  0.093 ct. Protected crown with letters "DS"